Izba Adwokacka w Warszawie wraz z Komisja Integracji Środowiskowej, Kultury, Sportu i Turystyki NRA zapraszają wszystkich przedstawicieli zawodów prawniczych na VII Otwarty Turniej Piłki Nożnej Adwokatury Polskiej. Turniej rozegrany będzie na trzech zadaszonych i sąsiadujących ze sobą boiskach ze sztuczną trawą. Każda zgłoszona drużyna zobowiązana jest do dokonania wpłaty kwoty 500 zł tytułem wpisowego do dn. 14 maja br. na konto wskazane przez Organizatora. Wpłata wpisowego powinna następować po potwierdzeniu zakwalifikowania drużyny do Turnieju. Wpisowe obejmuje także poczęstunek w trakcie turnieju. The Competition is reserved for the Barristers who are called to the Bar in the jurisdiction ofthe team in question, where the concept of “Bar” exists in the country concerned as well as for the Lawyers, legal counsels or other legal profession concerned in the countries where theconcept of “Bar” does not exist. Each team may register from 6 up to 10 players. Players shallprovide the document that confirms their membership to the Bar. The Organizer reserves theright to verify the membership to the Bar of each player. 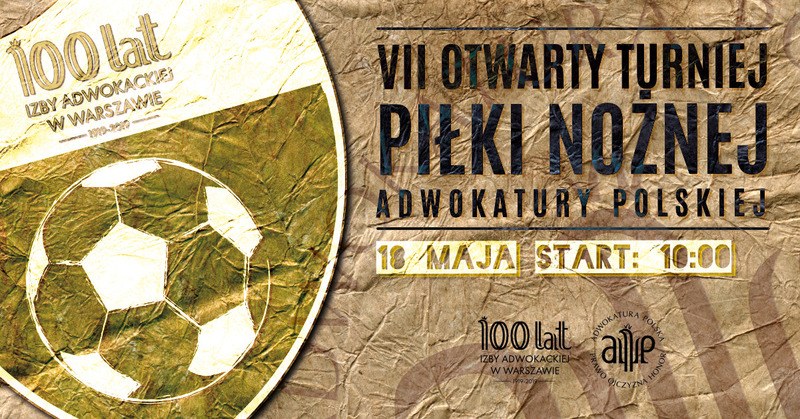 Under prior consent of the Organizer, each team is allowed to register only one player who is not a member of the Bar, but that player has to be related to other registered player and not being a professional football player. Judges, notaries and prosecutors are also allowed to join the Competition. In order to join the competitions the teams are required to send the application until May 12, 2019 by e-mail: pawel@halapilkarska.pl with payment confirmation until May 14, 2019. Tournament fee is 500 zł (approx. 120 Eur). The tournament fee should be paid to bank account no: 46109016940000000068028441 ordirectly to the Tournament organizer if it has been agreed previously. In bank transfer titleplease indicate: „Tournament”, captain’s name and team name. In case of not attending a competition, the fee will not be refund. Each member of the team takes part in the Tournament at his own risk. The matches are played by 6 active players (5 players + goalkeeper). Substitutions are unlimited, provided that one player leaves the pitch before another steps on. Substitutions must be carried out in the central zone of the pitch, when the ball is not in play. If the team does not perform properly change, the referee has right to award a penalty of two minutes exclusion from the game the player leaves the pitch. Team can not play a match having less than 5 players. The games are played on the pitch made of artificial turf. Throw-in must be carried out by feet from the side line. All players must to be at least3 meters from the ball. The referee has right to suspend a Player due to his unsporting behaviour orintoxication. In case of more than two teams with the same amount of points “small table” rulesdecides. A balance of goals in the matches between the concerned teams and then agreater number of goals scored. More specific details will be announced to teams when application term expires, no later thanMay, 16th 2019. All teams are required to maintain cleanliness and order in the premises of the footballcenter. In case of a situation not covered by the rules the Organizer has a casting vote. Give a consent to the Organizer for receiving in the future, by e-mail information about similar events. 20. Sending an application form and attending a Tournament will be understood as an acceptance of mentioned above rules by the contestants.